Heart of Haute is one of my go-to brands for not only work appropriate Pinup clothing but for evening and day wear too. Today on the blog we are taking a closer look at the Amanda dress in the chic Phoebe Paisley pattern. The dress is named after Heart of Haute’s founder Miss Mandie Bee, and is inspired by classic vintage style. 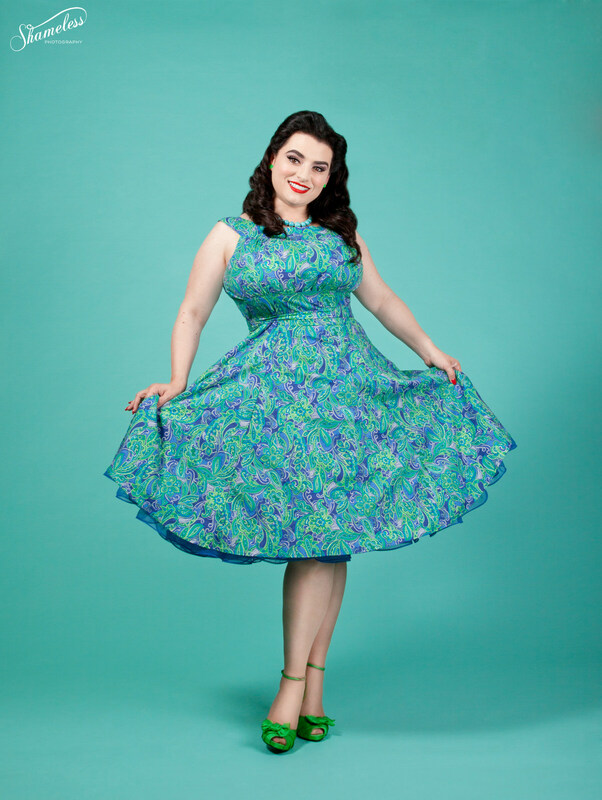 The Amanda dress features a round yoke collar, gathered bodice, and full swing skirt. I am a curvy girl that appreciates well-made clothing in flattering styles with a good selection of patterns and color combinations. I will also admit that I have insecurities like every other human out there. So, when I first saw the Amanda, I was hesitant because I didn’t think it would suit or fit my full bust and it was sleeveless so my arms would show. Truth be told, bare arms are not something I do, at all or ever. So, the Amanda was going to be challenging me as it was taking me out of my comfort zone. But, the dress had such brilliant colors of greens, blues and aqua blues (all my favorites) that I decided I was up for the challenge. I was literally in awe when I put it on. I was not expecting the Amanda to fit my curves this well!! The dress fit my breasts like a dream with no squishing at all and, the cut out for the arms was spot on perfect, not at all uncomfortable!! Also, as a bonus, I was able to wear my standard everyday bra and the straps didn’t show. My waist is smaller and this dress takes care of a roomy waist because it includes ties that allow you to nip in the waist. 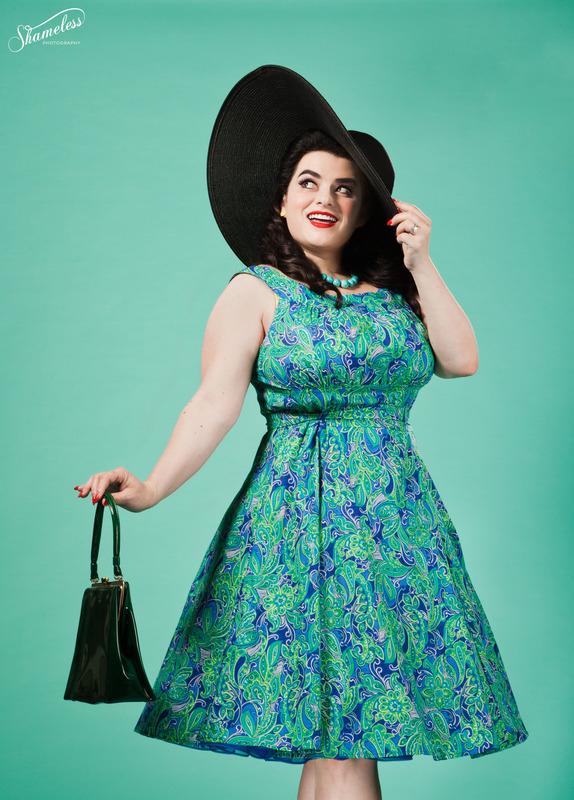 Once again, let me talk about the Phoebe Paisley pattern with its glorious color combo… it is so versatile because you can mix and match accessories, shoes, and petticoats to create your own stunning ensemble. So now you understand why I am in awe of the incredible Amanda dress. I was excited to do a photo shoot with my favorite team – Shameless Photography and shoot in the Amanda – Phoebe Paisley so I styled the shoot to have a chic classic elegant look. I am wearing the Amanda in a size 1X and it fits my G cups perfectly. 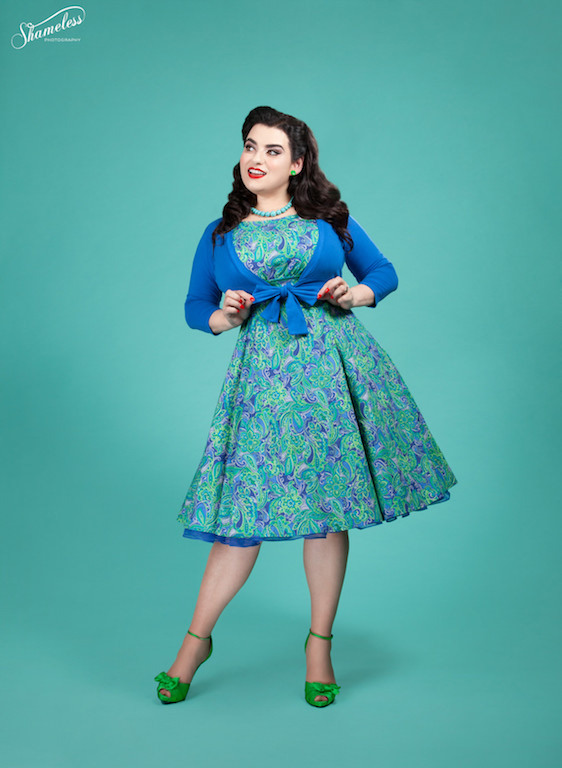 I added the fabulous Heart of Haute Sweet Sweater by Mandie Bee in True Blue and matching blue petticoat. My glamorous hat, purse, necklace and shoes add the perfect touches. I can wear the gorgeous Amanda dress to work and then out to a lovely dinner. Seriously, the day after my shoot I did wear it to the office and received so many compliments. The dress is 100% cotton so it is perfect for warmer weather and doesn’t wrinkle easily which is hard to find in light-weight materials. Go ahead and hurry over to Heart of Haute and snap up the Amanda dress and Sweet Sweater as they will not last long! !